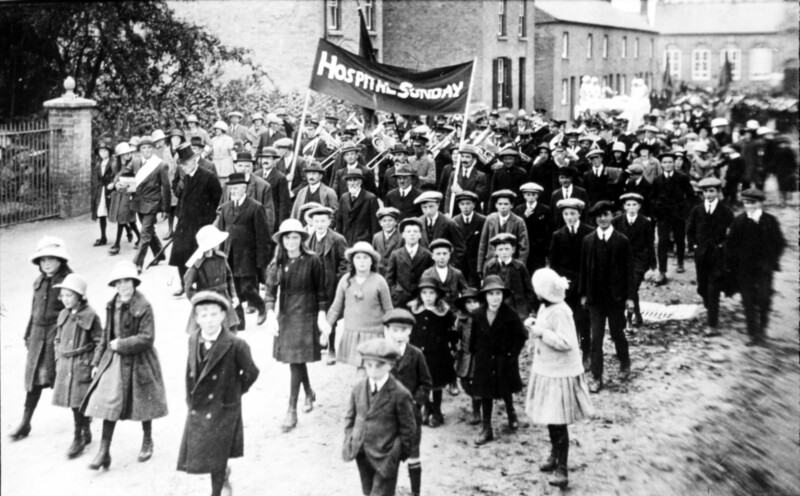 The Hospital Sunday parade moves up Church Lane around 1920. In those days there was no NHS and visits to the doctor or hospital had to be paid for. Most ordinary families could never afford a stay in hospital so, once a year, the village had a parade and everybody donated what they could afford. The money collected was quite substantial and was passed to Addenbrookes Hospital as a sort of insurance payment for the village so that Willingham residents could get treatment even if they could not afford to pay. At the head of the parade is the Rector of St. Mary’s followed by a brass band and various floats. Only the Rector wears a top hat. Some other men wear bowlers, while most wear trilbys or flat cap according to their social status.